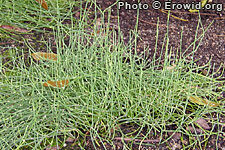 Ephedra is a low stalky shrub with jointed green to brown stems and tiny unnoticeable leaves. It is the source of ephedrine alkaloids and has an extremely long history of use in China. Supplements containing ephedra extracts are a popular herbal stimulant.